October 13, 2018 (Think Change India)—Born in a traditional Hindu household in West Bengal, Joyita Mondal suffered a lot of discrimination as a transgender person. She had to drop out of school, sleep at a bus stand, and beg on the streets. It no longer bothers her though, because all of it has contributed to who she is today—India’s first transgender judge. However, Joyita came to Islampur in Uttar Dinajpur district and never went back. 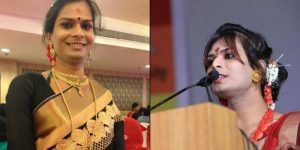 In the initial years, apart from attending functions as a hijra, she also worked for the rights of transgender people. Over time, she started working for the rights of anyone and everyone facing any kind of social discrimination. Simultaneously, she also completed her studies through correspondence and got herself a degree in law. In 2010, she was the first transgender person from her district to get a voter ID. A few years ago, Joyita started her organization, Dinajpur Notun Alo Society, that is currently reaching out to and helping thousands of people in her district. Despite all these feats, the fact that she had to sleep at a bus stand as hotels did not allow her to take rooms is still a sour memory.